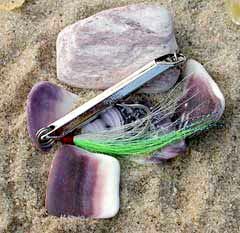 Fisherman's Line knows that when looking for bluefish lures, you need a strong saltwater bluefish lure that will stand up when attacked by this eating machine. Our bluefish lure selection is designed to get you into the fight and win. Bluefish lures must be made to withstand attack after attack, and that's just the reason we have selected our line of quality bluefish lures. 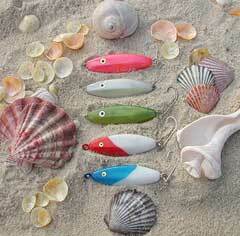 A phenomenal bluefish bait that will outcast all other wooden or plastic lures regardless of weight. Most important, it will stay on the surface and not dive when retrieved. Stan Gibbs, the creator of Gibbs Lures, began this company in 1945 when he first whittled unique wooden plugs that had the ability to attract fish. He began what is now the tradition of manufacturing quality wooden fishing lures with an outstanding record of consistently catching fish. The manufacturing operation is now located in Cumberland, Rhode Island, owned and operated by business and fishermen Dennis Ryan and Dan Smalley, who continue to manufacture quality wooden fishing lures the old fashioned way... by hand, in the good ole USA. The key is a fast retriever and some rod tip work which will cause the plug to dance and skip across the surface. Keep the plug in the water, however, as you are overworking it if it becomes airborne. Remember to slow the plug down when bluefish are chasing it, but striking short. 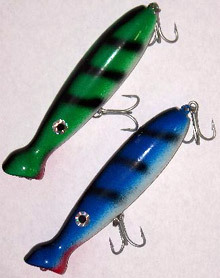 These "floating" plugs are made of high impact plastic around a stainless steel insert that runs the length of the lure. We also use stainless steel split rings and "VMF" saltwater grade hooks, and these plugs have molded-in rattles. Because of their durability and ability to withstand assaults from toothy game fish, they have become a favorite for many sport fishermen who hunt those "monster" bluefish. 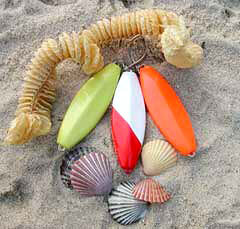 B & D Pencil Popper plugs are also great for striped bass! 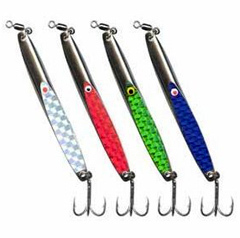 Robert's Lures are great for Bluefish, Striped Bass, Roosterfish, and Jacks. 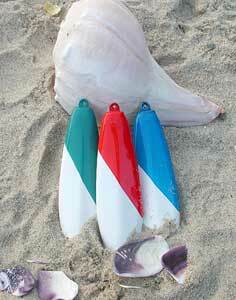 Use from the surf (designed for longcast) or from a boat (trolling or deep trolling with down rigger). 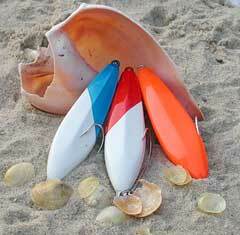 This product is named Whistler because it launches so fast on a typical cast, it creates an audible whistle. Consider the Whistler as a part of your lure selection for those times when the fish are on that offshore bar or otherwise beyond normal casting range. 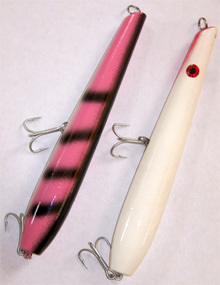 The Whistler is 4 ¼ inches long and uses a Mustad 7/0 hook. This is our newest offering and our first with a metal lure. The Hammer can be fished at any depth in the water column. It's slender profile is designed to imitate the sand eel. 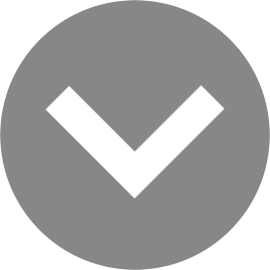 We offer four sizes from ½ oz. to 2 oz., and rig the lure with a white and chartreuse bucktail. The Hammer casts like a bullet in keeping with our philosophy that long casts are occasionally necessary. The Gibbs Pencil Popper sports a sleek, tapered design with a slightly weighted tail to help increase casting distance in heavy winds. The most effective retrieve is to point the rod tip at the plug and induce some rapid up-and-down tip action. Do this not violently, but steady, at the same time reel slowly to make plug dance from side-to-side on the surface. This plug really drives bass and bluefish crazy. The Gibbs Pencil Popper is made using stainless steel thru wire construction, top quality terminal tackle, and Mustad treble hooks.